Need to make a quick staffing calculation of how many agents are needed? Then our new online Erlang Calculator for call centre staffing may be just the thing. It’s free to use and requires no log-ins to get it working. Version 2.0 (released August 2016) now includes a Shrinkage Calculation as well. If you are unsure of what is included in shrinkage then we have written a comprehensive guide on how to calculate shrinkage. If you would prefer to get the results in Excel format then our Excel Erlang C Calculator may be a better fit, although this can only compute up to 600 Agents. How does the online call centre staffing calculator work? All you need to do is put in the number of calls (it also works reasonably well with emails) per half hour and the service level that you want to achieve. The calculator then works out the number of agents that are needed to meet that service level. 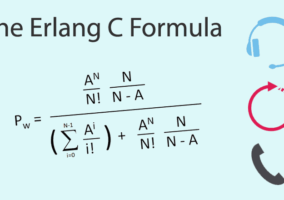 The calculator uses a very clever statistical calculation called the Erlang C formula. It is the basis of queueing theory and was developed by a Danish mathematician called AK Erlang in 1917. It was very much ahead of its time and is still going strong almost 100 years later. The calculations assume a Poisson distribution of calls and look at the probability of a call being answered within a service level. Call Abandons are calculated using the Erlang A formula (Erlang A stands for Abandons) which was devised by Swedish statistician Conny Palm in 1946. This assumes an Average Patience – also know as Average Time to Abandon (ATA). Time period – the period over which the calls arrive – typically 15 minutes, 30 minutes or 60 minutes. Average Handling Time – typically includes talk time as well as after call work related to the call. Maximum Occupancy – This is a factor of between 80% and 90% to make sure that advisors do not get burnt out. We have a guide on how to calculate maximum occupancy. If uncertain keep this as 85%. Average Patience – This is also know as Average Time to Abandon (ATA). This is the average amount of time that a caller will wait in a queue before they abandon on hang up. The calculations are quite complex and involved, but we have simplified them down to make it easier. Luckily Call Centre Helper’s super-fast servers can run these calculations up to 10,000 agents. 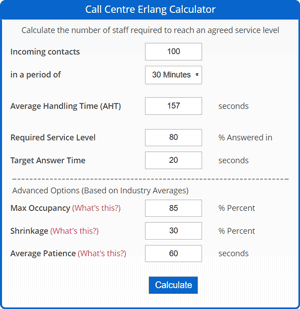 Click here to try out the new Erlang Calculator for call centre staffing. Need to calculate the number of agents for web chat and emails? We have also developed a Multi-Channel call centre calculator which can mix calls emails and web chat. It can also be used as a standalone calculator. It has a really nice visualisation that shows the contacts and the calls over time. Use of the Multi-Channel Calculator is subject to our standard terms and conditions. Click here for the Multi-Channel call email and web chat calculator. 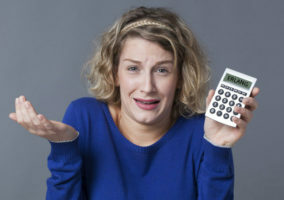 The Erlang calculator is designed for inbound calls. It is possible to do some form of modelling on outbound but it would not be very useful. For outbound calls you would need to do some form of simulation. Is there a calculator that can be used to determine how many agents are required on a live chat program whereby they take 2 or 3 chats at the same time depending on the type of chat received. Maybe I did something wrong, becouse I thing 22 agents for 15 calls, and 50 chats for a day is much more! That is in the development plans, but is not a trivial task to code, so may be a while before we can bring in this feature. You probably have got the wrong time period – it looks as though you have been running 15 calls, and 50 chats per half hour. I’m guessing that you kept the default as 30 minutes for Time Period length:. There are 480 minutes in an an 8 hour day. Running with the 15 calls, and 50 chats for a day of Time Period length 480 minutes (using the default durations of 187 and 450 seconds) I come out with 2 agents. Is it critical to apply shrinkage to each interval? Is it invalid to apply it against staff required for a day or a week? Great tools for the call center staff, thank you for sharing such an excellent tools with us. It’s best if you can apply shrinkage to each particular interval. The more granular you can get the better. Is there an easy way to calculate weekly staff requirements from hourly staff numbers produced by ErlangC calculations? Once you have got the hourly staff numbers and you have applied shrinkage, then all you would need to do is work out a schedule. This is typically done in excel. You work out the shift patterns that you want by hour and then you build up the number of differnt shift until you reach the staffing requirement. Just a quick question in relation to the new ErlangC version 3.1 vs 3.0. The occupancy figure is different for both versions. I used this calculator the other day and it told me I would have an occupancy of 56.5% however when I placed the same data in again for version 3.1 I get 80% occupancy. What is the difference between the 2 versions, is the 80% occupancy before Shrinkage in version 3.1? I think that the difference is before and after shrinkage. Occupancy is worked our before shrinkage. I think that both versions should be comparable. If you can share with me what values you used I can check them here. We used the below values for both versions. The only difference is the value in version 3.1 where we requested 80% occupancy. My team has total of 10 FTEs. We receive inventory on an average of 300 per day. Out of 10 FTEs 5 of them are able to do 23-30 per day and remaining 5 are capable of doing 8-10. So how I will apply Capacity planning for my team so that I can manage my inventory and produce more nos. I’m interested in hearing the response to Amar’s comment on the capacity differences of operators and how that might be considered when staffing.